VMware currently have A LOT of open positions that are focus around VMware's End User Computing technologies. There are both pre and post sales roles going around the world. If you can see a role that you are interested in, drop me a email via my Contact Me page and I'll make sure your resume/CV gets to the right people. One thing that I had noticed was that the application launching wasn't working when using Google Chrome both on my Mac and on Windows whereas Firefox, IE and Safari worked fine. Being able to launch the View Client from Google Chrome is something that I will be using more and more in the future, so I decided I would try and figure out how I can get this to work. In an earlier post I mentioned that vSphere 5.1 is not compatible with any versions of VMware View. Well I am please to you inform you all that today VMware have released an express patch for ESXi (ESXi510-201210001) which fixes an issue that caused the incompatibility issue. For those of you who follow me on twitter you may well have seen me tweeting about the View 3D Experience over the duration of both of this years VMworlds. 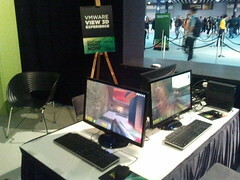 Myself and a colleague Tim Federwitz (virtuallygeeky.com) had been tasked to showcase VMware's vSGA (Virtual Shared Graphics Acceleration) that will be released in the next release of VMware View at some point in H1 2013. Before I go into what we had running at VMworld, I'll just go into a little more detail about vSGA (Virtual Shared Graphics Acceleration). I've passed! It's over! After working towards this goal for the last 4 years, I have finally made it. Time to relax. Overall, despite the many many hours I spent working on my design to make sure it was as solid as possible, I enjoyed the process. I learnt the most from just being extremely careful on EVERY design decision I made. I knew, if I made a mistake on anything I would be picked up on it, so I spent many days going through everything to make sure it was accurate and I could back up the reasons for making those design decisions. This has undoubtedly helped me as a consultant. As for the defense itself, for some reason I wasn't actually nervous, no dry mouth, no shaky hands. I think this was because I knew my design was good, I was confident in what I had designed. Filled with confidence and a clear mind, I tired to answer and explain everything that was asked and if there was something I really didn't know, I was honest and held my hands up. You can't trick these guys, so don't bother trying. The whole experience was over in a flash. The wait for the results was the opposite. Defense – Spend time making sure everything you have chosen in your design is accurate and you fully understand the reason you chose it and the reasons why you didn't chose the other options. Design – Read the scenario thoroughly. Understand it. If something isn't clear, ask the panel. Talk them through everything you are thinking with regards to how your design might look. If you don't talk, they don't know that you aren't just making something up. Troubleshoot – Don't worry too much about finding the issue. Make sure you troubleshoot methodically. If you need the "customer" to do/test something, tell them why you are asking them to do it, so they understand your train of thought. And DON'T PANIC if at first you don't know what the issue might be. Hello people, I've just noticed that I have neglected my "Recommended Blogs" section for far to long. So if you have a Virtualization focused Blog, you are not already on my list and would like appear on my recommended blogs section please use my Contact page to email me your url and I will review you blog. If I feel it is appropriate, I will add it to my list. Could you also include your RSS feed URL so I can add you to my personal RSS Feed Reader and keep up with all of your great articles. 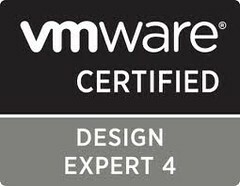 vSphere 5.1 is in the process of being certified against VMware View. We recommend that you do not upgrade vSphere above the supported versions listed in the VMware View 5.1 Release Notes. vSphere 5.1 is not compatible with any versions VMware View (2035268). I'll hopefully see you all there. I just wanted to bring this to peoples attention. Join us for the next Northwest England VMUG meeting taking place on Thursday, Sept 13th, 2012. Looks like a great agenda for their next VMUG. You can follow the official NW England VMUG Twitter profile for the latest VMUG news.